WINDING ROAD (SET OF CURVES). 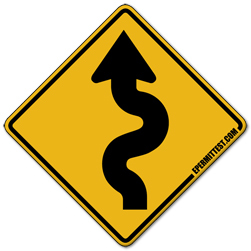 This sign indicates there are three (3) or more curves in a row on the road ahead. The sign is frequently accompanied by an advisory speed sign. Slow down to recommended speed before you enter the curves.